Would you believe that we’re still working off the last of the apples from our apple-picking outing? I know! One of my very favorite salads is a mesclun-apple-cheddar cheese-walnut salad. Yum. I throw on a very basic little vinaigrette of apple cider vinegar, olive oil, water, salt & pepper, and a tiny smidgen of honey. I’ve been having one of these every day for a few days now. Meanwhile, J’s been begging for caramel apples. But, she stipulated, she wanted real caramel, not the ones that you unwrap and melt. This is the problem when you make tasty foods: suddenly your kid is too much of a snob for the store-bought. Now, don’t get me wrong: I usually do go with the store-bought caramel apples, the ones where they’re already flat little caramel pancakes. 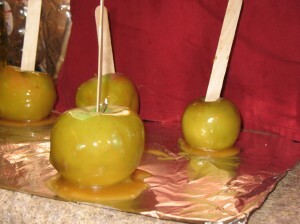 But I happened to have wooden sticks among our craft supplies, and Cute W has an unbelievably yummy Caramel Corn recipe, so I decided to see if we could use it for gen-u-ine caramel apples. 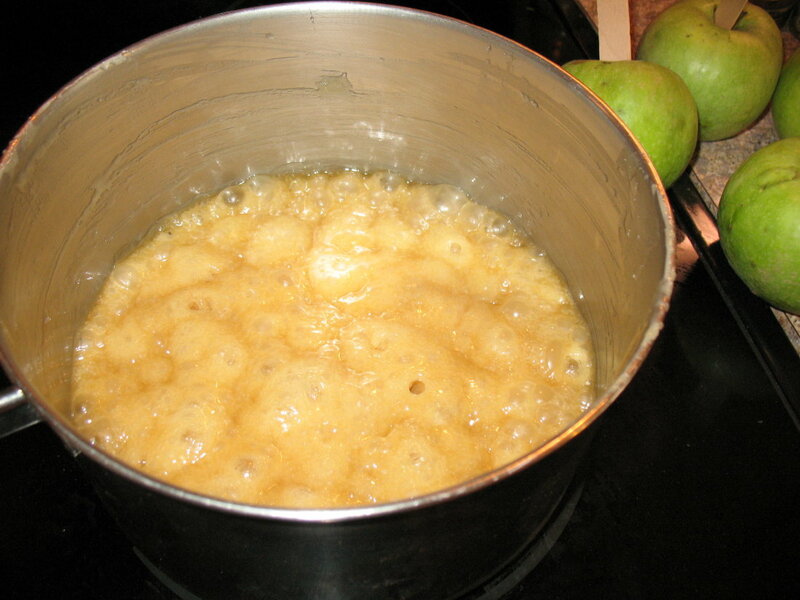 Melt the butter, sugars and syrup in a pot and bring it to a boil. Let it boil for 7 minutes. Remove from heat and stir in vanilla. What I love about this is that a candy thermometer is not involved. I like cooking and baking, but candy-making completely intimidates me. I once spent a hellish afternoon attempting to make traditional pull-candy in oppressive heat with a crowd of impatient children and muttering parents surrounding me, and I still have flashbacks. So, pretty much if I read any reference to a thermometer in a recipe, I reject it immediately. We had decided to make a few caramel apples and some popcorn, because M and Cute W are more enthusiastic about the popcorn option. 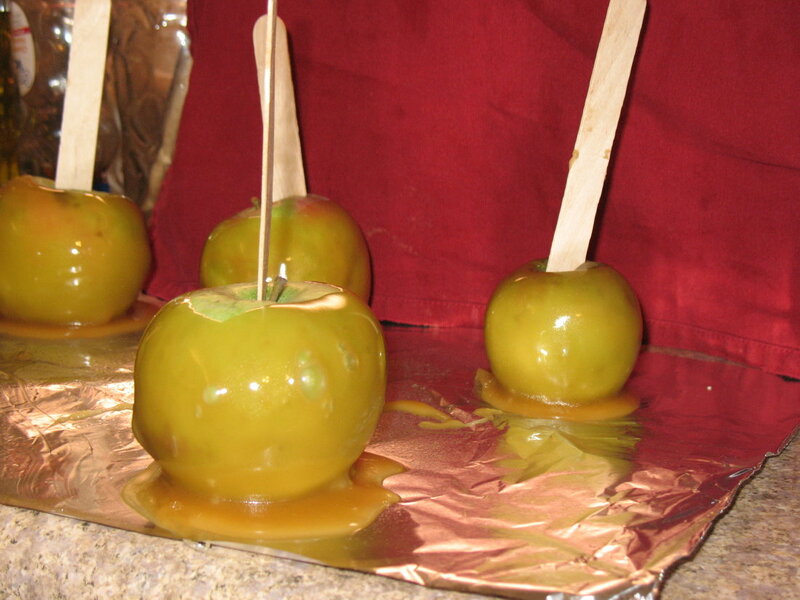 We were sort of winging it, and if I had to do it again, I’d let the caramel cool a little more before letting the girls dip the apples–there was some serious sliding-and-pooling by the caramel–still delicious, but not optimal aesthetically. 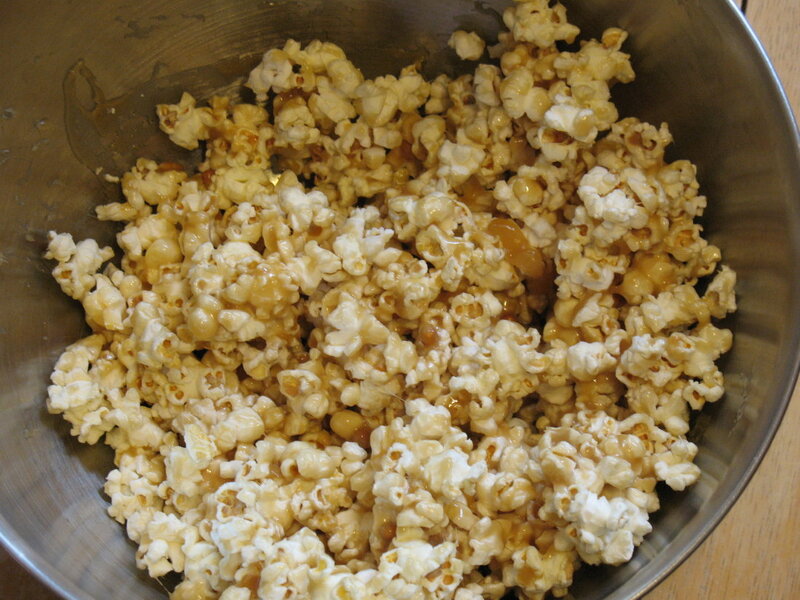 Then I put the rest of the caramel on a half-batch of popcorn. This is usually the most stressful part. It starts out quite liquid and boiling, painfully hot, and as you’re mixing it, it swiftly turns to (yummy) cement. I find it better if there’s actually no one in the same room with Cute W when he makes it. 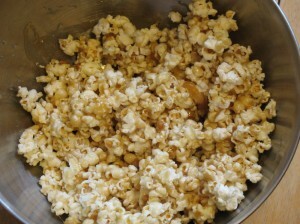 Oh, also, he usually carefully clears the unpopped kernels of corn, a crucial step that I forgot. If viewed optimistically, one could argue that the peril of possibly breaking a tooth at any moment only made eating the caramel corn more exhilarating. Whatever. It was worth the risk. So, all three girls were munching and salivating (the peculiar challenge of attempting to eat a caramel apple can cause even 40-year-old women to drool. Or, you know, theoretically, I bet that it could). 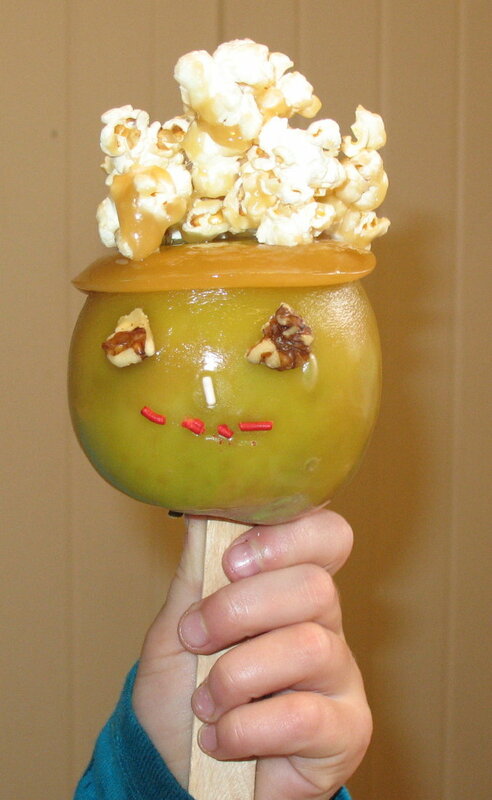 Actually, with the popcorn hair, it looks more like a Popcorn Marie Antoinette.